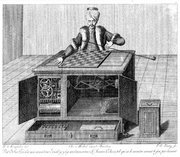 The Turk was a famous hoax which purported to be a chess-playing automaton first constructed and unveiled in 1769 by Wolfgang von Kempelen (1734-1804). It had the appearance of a maplewood cabinet 4 feet long by 2 feet deep and 3 feet high, with a mannequin dressed in cloak and turban seated behind it. The cabinet had doors that opened to reveal internal clockwork mechanisms, and when activated the mechanism appeared to be able to play a strong game of chess against a human opponent. It could also perform the knight�s tour (a puzzle which requires the player to pass every square of a chess board once) with ease. However, the cabinet was a cleverly constructed illusion that allowed a man to hide inside and operate the mannequin. Kempelen first exhibited the Turk at the court of Austrian Empress Maria Theresa in 1770, and later took it on a tour of Europe for several years during the 1780s. During this time the Turk was exhibited in Paris where Benjamin Franklin played it and lost. Kempelen eventually decided that the Turk was occupying too much of his time and consigned it to a corner of the Austrian palace, and focused on other forms of automata. In 1789, Freiherr Joseph Friedrich zu Racknitz built a duplicate Turk and wrote a book suggesting how it might work, published in Dresden. Although his explanation was correct in some parts, the explanation resulted in a Turk which could only be operated by a child or dwarf, and the measurements of Racknitz�s Turk were not the same as Kempelen�s. Maelzel took the Turk to play in France and in England, but due to mounting debts, fled Europe to exhibit the Turk in the United States of America. While in England in 1820, Charles Babbage, the computing pioneer, played against the Turk. The Turk�s tour of the United States was a success, and Maelzel decided to bring the Turk to Cuba as the first leg of a South American tour. However, while there, his secretary and confidante, William Schlumberger, passed away. Many reports indicate that he was the man inside the Turk who actually played the games; he was an expert chess player. Whether or not this is true, afterward the rest of Maelzel�s party deserted him, and the bankrupt Maelzel reluctantly sailed back to the United States. On board the ship, he took to drinking alone in his cabin and as the voyage neared its end, Maelzel was found dead in his cabin, and buried at sea. The Turk was then auctioned off, and the new owner in turn sold it to Dr John Mitchell, a Professor of Medicine and Surgery, who had founded a club for the express purpose of purchasing the Turk. In return for a fee, he would reveal the Turk�s secret to the club�s members. Although Mitchell enjoyed moderate success exhibiting the Turk at first, he lacked Maelzel�s showmanship, and eventually gave it to a museum in Philadelphia. In 1854, 85 years after its construction, the Turk was destroyed in the great Philadelphia fire. Mitchell�s son, Silas Mitchell, eventually published a book on the Turk explaining its secrets. At least 15 chess experts and masters had operated the Turk over its history. It prompted numerous books and pamphlets, none of which ever quite guessed its secret. Edgar Allan Poe wrote an expos� of the automaton, much of it cribbed from an earlier English account, in 1835. The format of his report on the Turk prefigured his later invention of the detective story. The secret of the Turk was due to the foldable nature of the compartments within the Turk�s cabinet, and the fact that the "machinery" and a drawer in the cabinet did not extend all the way to the back of it. Within the cabinet was a secondary chessboard, which the operator used to follow the game. The bottom of the main chessboard which the Turk itself played on had a spring beneath every square, and each piece contained a magnet. This intricate system was used to indicate to the operator which piece had moved and to where. The operator made his move with the use of a special device which could be fitted into special holes on the secondary chessboard to indicate to the Turk where to move. This article is based on the article The Turk from the free encyclopaedia Wikipedia and stands under the GNU-Licence for free documentation. In the Wikipedia a list of the authors is available.